Ridership on New York City transit has reached a peak, according to the MTA, but despite that, available subway exits remain shuttered for commuters, which can be dangerous in this era of unprecedented crowding, an I-Team investigation has found. I-Team cameras captured exits and staircases at subway stations that were either locked behind heavy gates or completely boarded up. These an all too common sight, straphangers say. According to MTA data obtained by NBC 4 New York partner WNYC, of the 468 stations in the subway system, there are 119 stations with at least one closed entrance. In the late 70s, the MTA closed some entrances because of declining ridership and to help prevent crime. But now with people swiping MetroCards at record levels -- more than 6.2 million people on a single day, according to the MTA -- calls to reopen those entrances are growing louder. It's not just a matter of convenience, it's a matter of safety, said Glenn Corbett, a professor at John Jay College of Criminal Justice. "These exits should be made available again to give people a choice of getting away from something” such as in a fire or a terrorist attack, he said. According to Corbett, buildings in New York City are required to have a certain number of exits. For example, buildings with up 500 occupants need to have two exits. Buildings with more than 1,000 occupants need four exits. 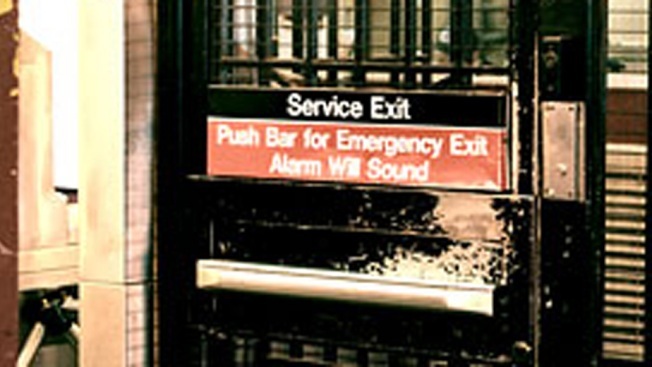 At some subway stations, there is only one means of exiting -- a clear violation, according to Corbett, of National Fire Protection Association standards that demand "two means of egress remote from each other shall be provided from each station platform." Former Fire Commissioner Thomas von Essen who headed the FDNY through the 9/11 attacks, says multiple exits are needed now more than ever. "You're really taking a risk by not having as many exits as possible that you can use," von Essen said. "If there's an incident at one end of the station, they should be able to get out." It’s something New Yorkers are thinking about now, with pictures of the attacks in Paris and San Bernardino fresh in their minds. The MTA says it is considering reopening some of the entrances, but doing so is not so simple. Some exits are merely locked, while others are boarded up, re-configured or covered with a layer of concrete. Pending funding, the MTA will try to reopen entrances on the A/C line at Franklin Avenue, 168th Street and 50th Street, the agency said. The agency has also applied for federal funding to build a new entrance at the First Avenue L station, where commuters are bottlenecked out of the only exit at one end of the platform. The MTA says it is grandfathered in on many national fire standards because the transit system is so old. Compliance might mean a full, top to bottom remodeling, which would not be practical, the agency said. Still, the FDNY told the I-Team in a statement, “Exits should be available for use at all times based on highest anticipated occupancy, and when means of egress are found inadequate NYCTA is notified for resolution.” There is also a fire officer who is dedicated to working with the MTA on these issues. Another complication involves the Americans with Disabilities Act. When reopening an entrance, the MTA is obligated to make that entrance ADA accessible which is not always practical or possible, so they keep the exits closed as a result. But those excuses mean little to commuters. “Not do anything about the possibilities that we are mindful of, is irresponsible,” said Danielle Inge.